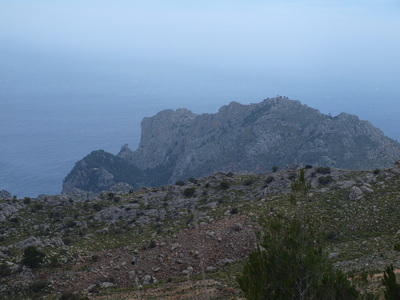 The Cami des Cingles rounds Puig Major on its north western side (sea side). 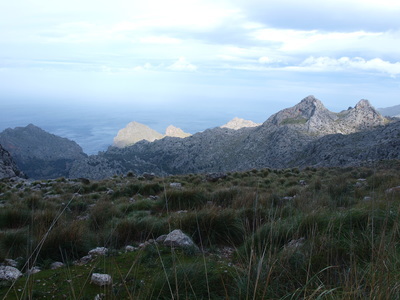 It offers nice views, is easy to follow and gives the possibility of a hike all around the Puig Major massif returning via Portxo Esbucat, the coma de Turixant & son Torellas on the southern side of the mountain. 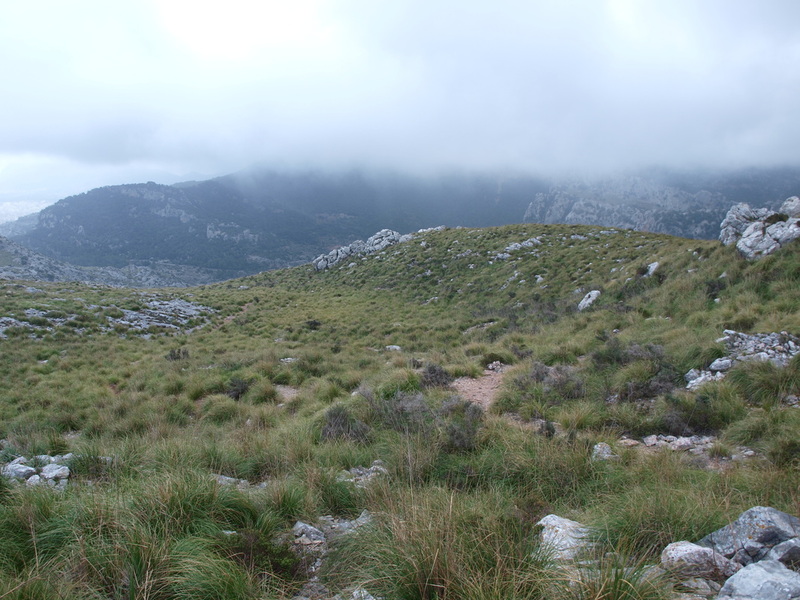 The trail from Portxo Esbucat is indistinct for a short distance , but the direction to follow quite clear. On the inland side of the mountain there are good views on the Puig de ses Vinyes and on the "Pa de Figa" cliff face and the Frare pinnacle. The only other drawback is the compulsory return via the unlit Tunnel de Monaber, so bring a flash light to notify car traffic of your presence in the dark and damp subterranean passage. By car: park at the view point of the Soller side of the Tunnel de Monaber. 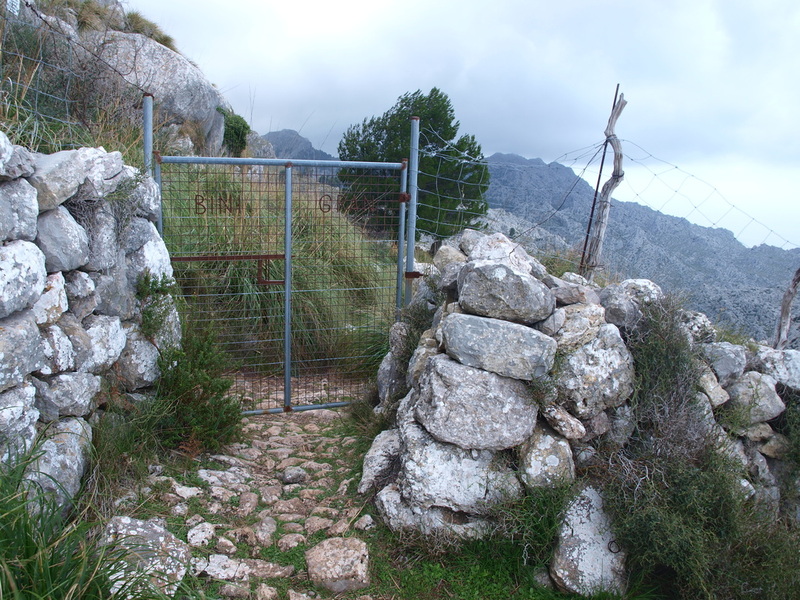 You can also park at 'Es Finicular' on the Sa Calobra road, but this calls for a longer walk and drive. 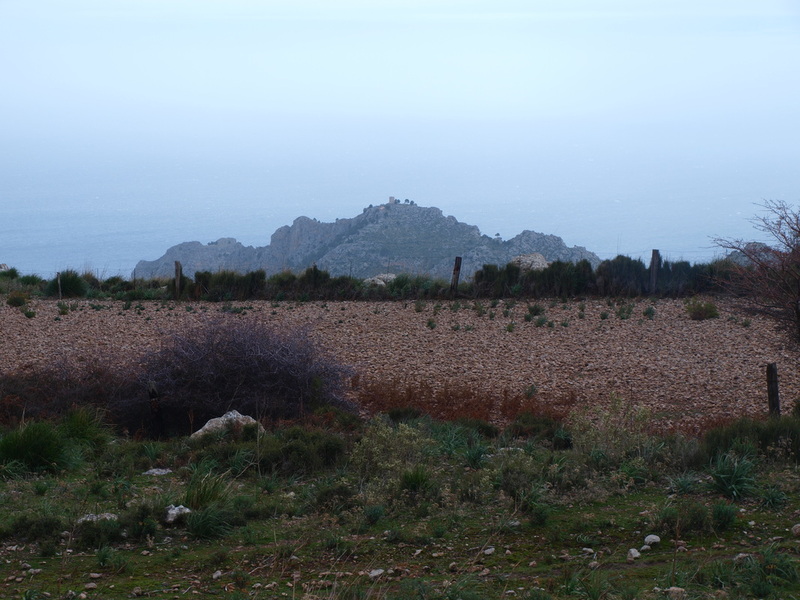 By Bus: between April and October service 354 leaves Soller at 08:40 am. There is no proper bus stop at the Tunnel de Monaber, so if you fail to sweet talk the driver into dropping you off, you will then have to hop off at the army camp a good two km away and backtrack. The return trip to civilisation is more problematic, as the service back to Soller is either very late around 6 pm, or too early, around 11:30 am at the Sa Calobra junction on the Ma 10. 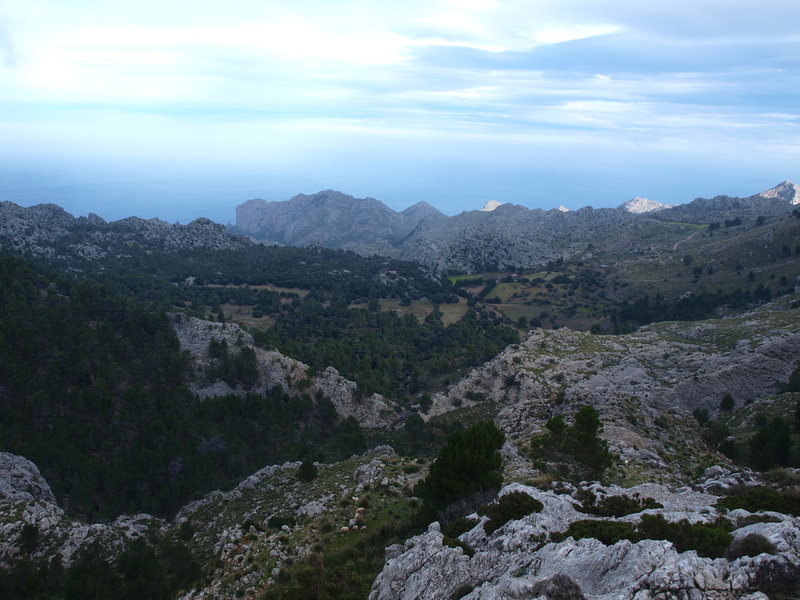 Once again it makes sense to return to Soller on foot via the val de son Torella & the portal de sa Costa, a 3 hrs walk (or down the Barranc de Biniaraix, maybe via the Xaragall d'Es Verger). A walk along the Cami de Cingles could also be combined with a descent through the mysterious mountains by the sea, a much more difficult but exciting endeavour leading you towards Cala Tuent and ultimately Sa Calobra, from where you can catch a boat back to Soller in season. This circuit can be walked clockwise or anticlockwise. 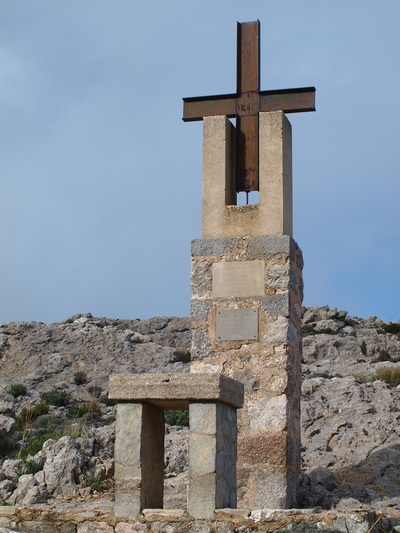 In order not to offend the Buddhists reading this, I will circumnavigate the highest peak in Mallorca clockwise, just like one does around mount Kailash. 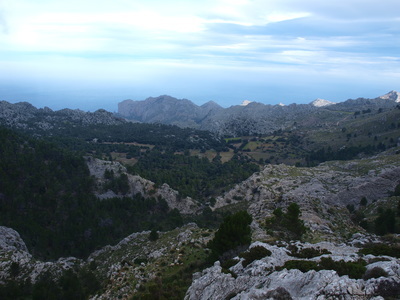 Walk down the asphalt from the mirador on the Soller side of the tunnel de Monaber for about half a kilometer, till you reach the first clear track branching off to the right, slightly before the hairpin bend on the asphalt. 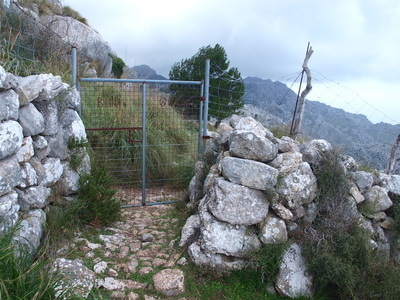 Take this track, pass the steel rockfall protection nets, and climb over a style by gate. 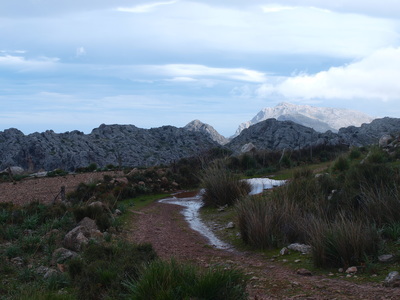 Take a right uphill here in order to avoid a finca on the track further ahead. Keep going till you reach the coll des Cards Collers, where a lonely iron cross reminds you of the sanctity of your surroundings. Keep on on the jeep track, going slowly downhill, enjoying good views over the Bini farmsteads and the sea side watch towers. After at the most an hour's walk (from the tunnel) you will reach the Pla d'en Gumbau where the main jeep track will take a sharp turn to the left towards the farmhouses. Ignore this and push ahead on a minor track that soon turns into a cairned trail. level at first then climbing slowly towards the Portxo Esbucat. 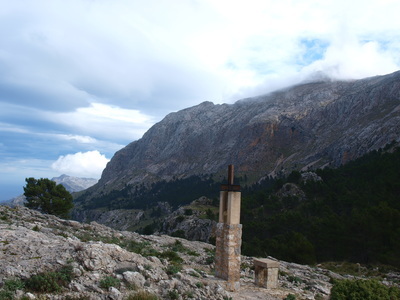 After enjoying more good views, you will reach the col of Portxo Esbucat, with its set of power lines. Here comes the tricky bit. 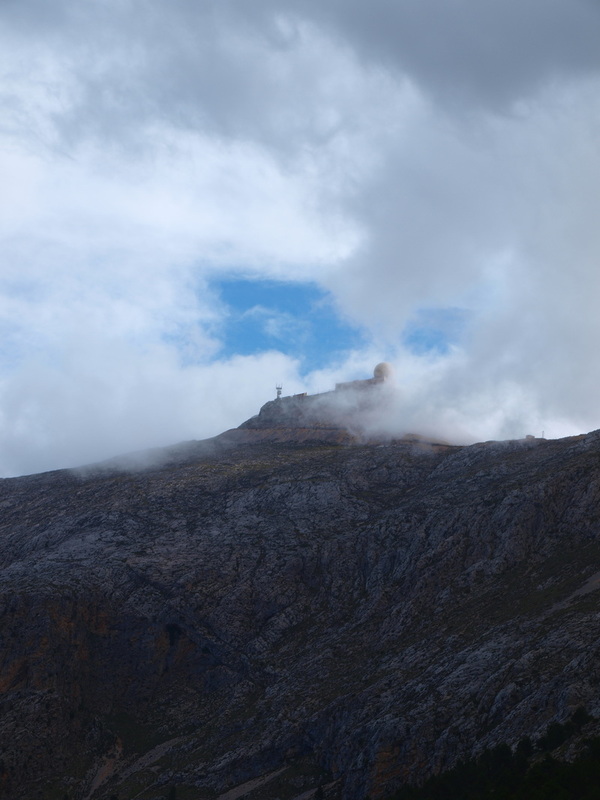 Go down from the highest point of the Col for maybe 300 meters and leave the trail by a cairn bigger then the others. From here walk cross country south east, on a grassy slope bellow a small set of cliffs. 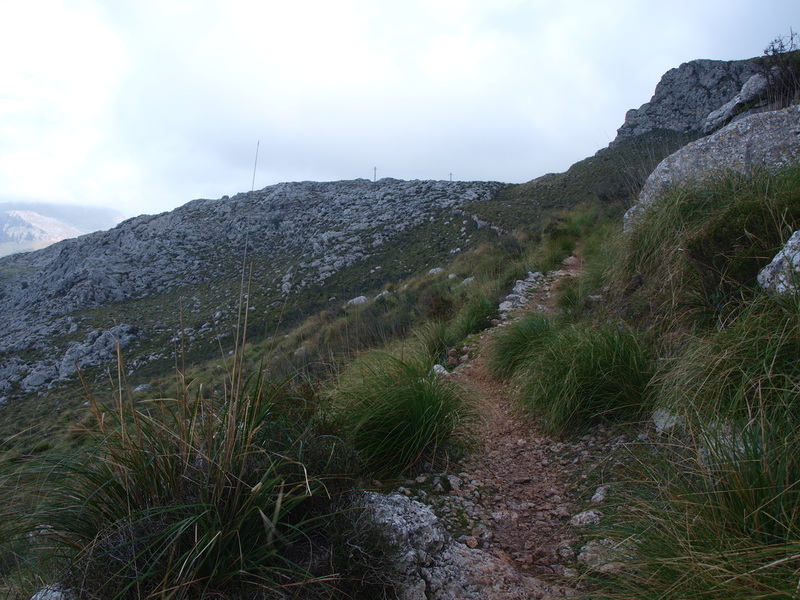 There is no trail as such but if you are lucky you might spot a few cairns. The way is a first level, then down hill. You should stay above the cliff above the road, till you reach a proper track close to the forested area. This may sound difficult but the start of the larger track is just above and beyond the hairpins bend on the main road not far away, and is not hard to find. The cross country walk from Portxo Esbucat to the track should take at the most 30 minutes, Those going around the mountain the other way should aim for the power line at Portxo Esbucat. 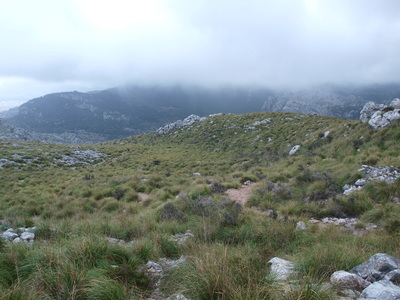 Push on downhill on this track; ignore a turn off to the left and stick to the right, uphill through the coma de Turixant. 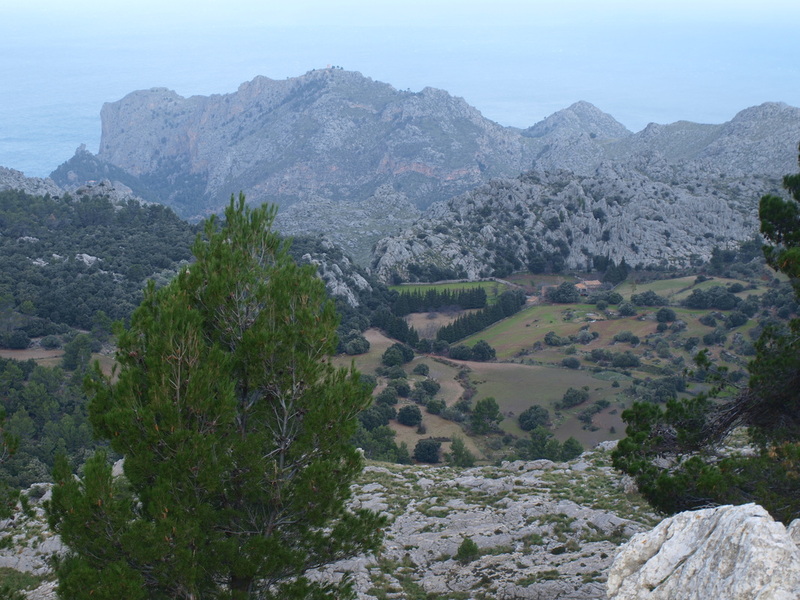 After a few bends you will come to the foot of the Puig de ses Vinyes, that you can climb as a side trip. Keep left at all trail junctions. You will soon reach a gate; if it is locked you will have to hike quite a long way to the left to find a style made of bent concrete irons. Follow the trail through the reforestation area, that you exit at its southern end by an other style. 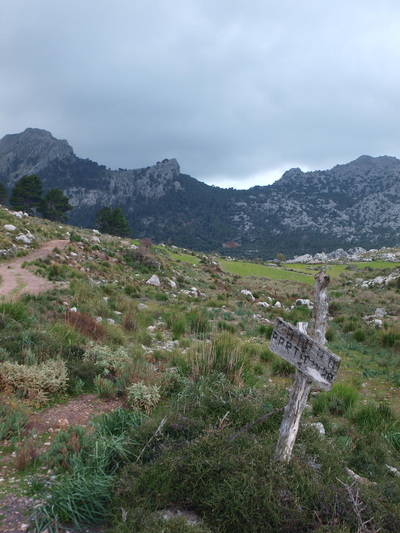 The way is cairned from here on, leading you into a small wooded valley that you follow downhill to the main road by the army camp.